Every year, we hear the same resounding New Year's resolutions - go to the gym every day, lose five pounds ... "New Year, New You." We stick to them for about a month and then fall off the wagon by the time February comes. I tend to believe that while a new year can encourage us to start fresh, we can still create goals at any time of the year - but they should always be attainable. Becoming a better version of yourself is an ever-evolving project, not just something we can resolve to do in one year. But setting simple goals for the year can help us identify what direction we want to go in. Plus, when you check an item off your list it really boosts your self-confidence! We put together some easy goals that can be accomplished any time of the year. Travel helps you gain perspective - experiences over things any day. The benefit of traveling when you're young is having more stamina and less physical limitations. This goal doesn't mean you need to travel to the other side of the world, it could also be a trip to that gorgeous town you've always wanted to see two states over. Always wanted to go sailing? Bake home-made bread (my New Year's goal last year)? Do it! Seize the opportunity and cross one item off your bucket list. Start small and if you get the gumption, do more! As we've stated, this goal seems obvious to every human that thinks of the phrase, "New Year's resolution." Instead of making an impossible goal such as joining cross fit and getting a six pack, set achievable goals. This might mean going to the gym once or twice a week or just parking farther away from the grocery store and going on more nature walks. People like to say that millennials are obsessed with self-care but in reality, this is not a new concept. It's important to invest time in yourself - whether that means finding better, more healthy ways to cope with stress or improving the way you communicate with others. Self-care doesn't equal getting facials every week, it just means you take the time to better yourself. Self-care can help you find balance and will help you care for others better, too. This can take different forms. It might be attending a conference in your field, listing to a podcast or taking the next step in education whether you are getting your BA, MA, or PHD. Sometimes it’s just nice not to look at a screen. I started a new tradition of buying books set in the location where I travel, and signing them with the year/date traveled. It’s like a bridge of memories that I can look on fondly in the future. I recently found out that reading out loud also can increase your vocabulary and communication skills. This sets the focus for the day. I really hope to make my quiet times even more of a priority this year. For me it is best to begin my day peacefully in the early hours of the morning. Stick to it - Don't Give Up! Whether it’s one of these goals or your personal goal, keep with it. When we started a blog last year people said, “It’s a saturated market.” Statically most people who start a blog drop it soon after. We enjoy navigating the blogging world even with its many challenges. 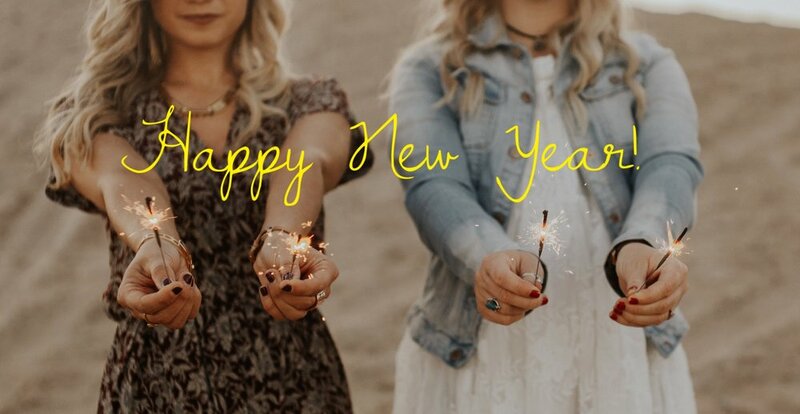 So cheers to the new year and making goals with your bestie! We wish you all great joy in the New Year - and good luck with accomplishing your goals, big and small!